New research on climate change paints a bleak picture of the future: a planet plagued by droughts, wildfires, floods and food shortages. Elon Musk, the founder and CEO of electric-vehicle company Tesla, could be the key to turning back the climate clock. The UN authority on climate change, IPCC, has warned the Earth is closer to experiencing a temperature increase of 2°C than expected. Passing this point would likely throw our delicate ecosystem into a tailspin, sparking an upsurge in natural disasters and permanently altering habitats and landscapes. Musk’s vision of replacing fuel-guzzling vehicles with electric-powered alternatives, slashing the environmental impact of transportation, must be part of the solution. Setting aside Musk's recent behaviour, Tesla has proven it can power a range of vehicles with electricity. Its offerings include the Roadster, a sports car that can go 0-60mph in 1.9 seconds; the Model 3, which makes electric cars more affordable at a price of $35,000; and the Semi, which can travel 500 miles on a single charge and promises to replace the conventional lorry. 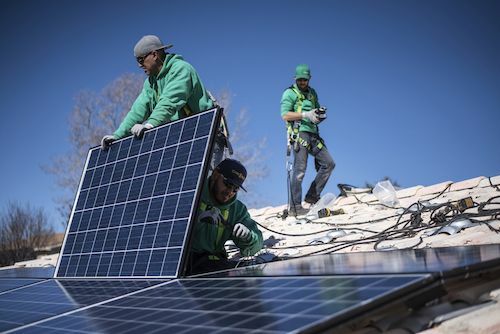 It has also introduced the Powerwall - an energy-efficient home battery - and owns SolarCity, which manufactures and installs solar panels for homes and businesses. Even if Musk fails, he has blazed a trail for traditional vehicle and energy companies to follow. Vehicle emissions are only one contributor to the latest apocalyptic prophecy, however. The IPCC report champions the use of smart thermostats and energy-efficient air conditioners in buildings, and suggests people reduce their meat intake by 30% in order to shrink the livestock sector, which contributes 14.5% of global greenhouse emissions. Factory fumes and electricity generation are also major sources of carbon dioxide emissions, highlighting the fact that the electricity used to power electric cars must come from somewhere. Technology companies can’t solve climate change alone either; governments also play a critical role. In 2015, all 195 UN member states signed a treaty to keep global warming well below 2°C. However, US President Donald Trump plans to bow out of the accord in 2020, claiming it will “undermine [the US] economy” and put it “at a permanent disadvantage”. As the second-largest producer of emissions after China, America’s withdrawal could be damning for humanity and prompt other nations to follow suit. The US may have to pay the bill anyway, when it provides disaster relief to nations devastated by global warming. Environmentalists and clean-energy revolutionaries face a particularly thorny problem in climate change, as it’s the ultimate ‘tragedy of the commons’. When each individual or country acts in their own self-interest without regard for their overall impact, and they don’t have to pay the costs of their actions and can see everyone else doing the same, it’s hard to convince them to sacrifice for the greater good. Musk’s efforts are rays of light in a dark sky, but he can only do so much. Pulling the climate back from the brink will require unprecedented cooperation between innovative entrepreneurs, conscientious consumers, responsible businesses and proactive governments across multiple sectors, focused on long-term prosperity rather than short-term enrichment.